Good plan to purchase souvenir from Tunisia: remen that and at what price? Carpet: below 175 €, no customs problem. In addition, the French Customs will condemn you to 19.6%, remember to request an invoice to the merchant carpet. 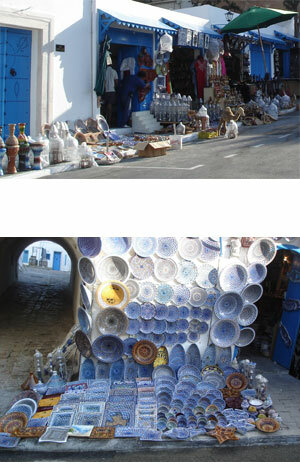 Pottery: if you go through Nabeul, north of Hammamet, visit the pottery workshops. Buying in the workshop is by far the cheapest. Objects of copper: not bad for the decoration of the kitchen. They are found in most medinas Notament. Bird Cages: specialty in Sidi Bou Said, very decorative. Kohl and scents of the Orient. Kohl is a powder makeup created from antimony, a metallic mineral. are found in perfume souks. There is a margin and it is not unusual to grater 70% of original price. Pay in local currency is generally cheaper in the negotiation. Add to bookmark this page Tunisia " Shopping & Souvenirs " - Firefox do "Ctrl D"